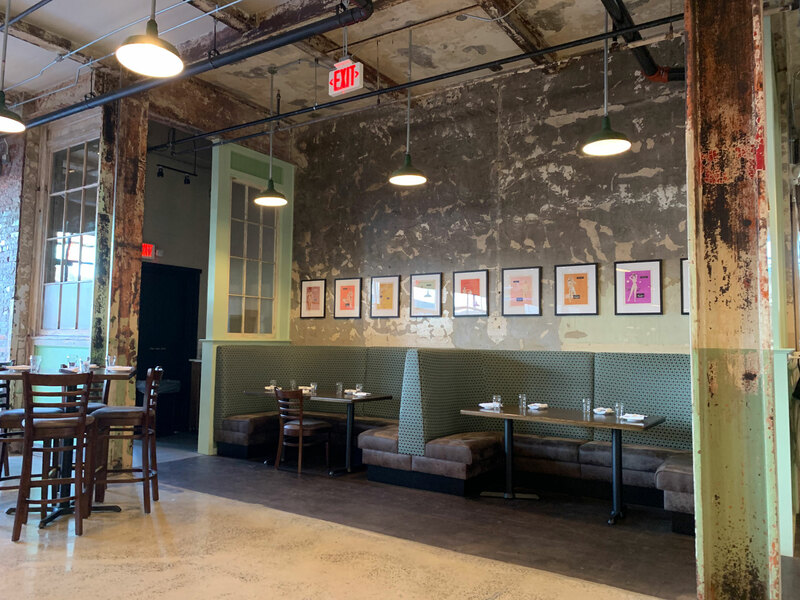 In more than five years of Berks County Eats, there have only been a handful of restaurants that arrived with the hype of B2 Bistro + Bar. 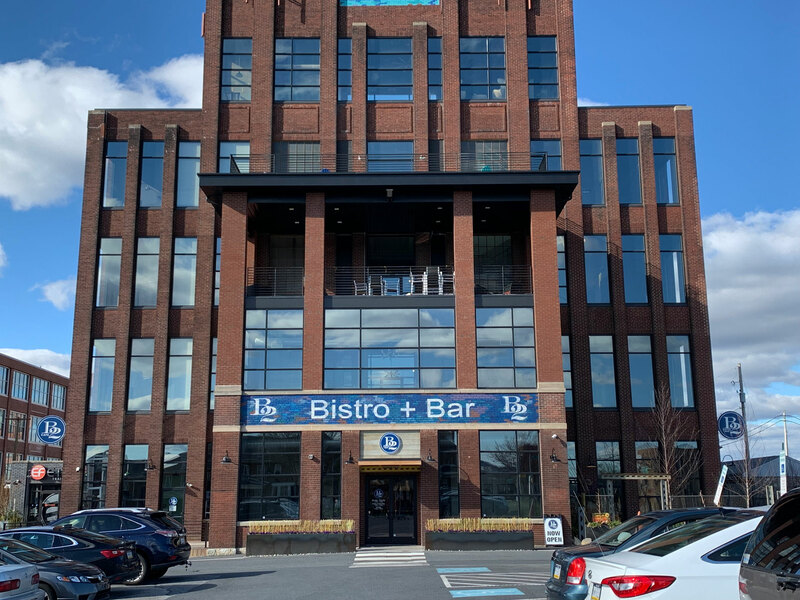 Recently opened in the former Narrow Fabrics building in West Reading, the restaurant had been anticipated since the first tenants moved into the Lofts at Narrows, the luxury apartments on the upper floors. The creative re-use of the building has led to a unique atmosphere. “Unfinished” paint and exposed beams – some still with original safety warning posters – can be seen throughout the space. A large rectangular bar is surrounded by high-top tables with a couple booths along the sides. 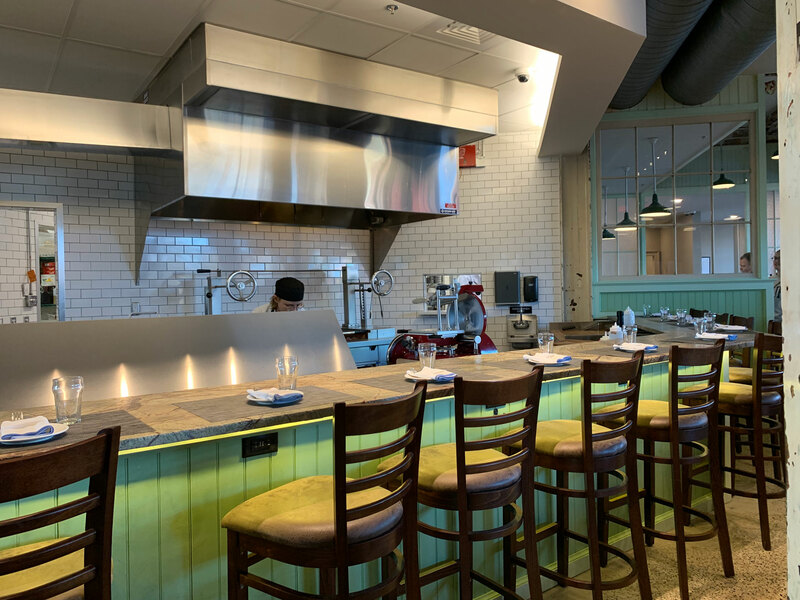 A row of stools can be found in front of the open kitchen, providing a unique experience for diners wanting to watch their chef in action. On the opposite side of the room, large garage bay doors open to create an outdoor feel during the warm weather months. Another smaller dining room is located toward the back of the building and features low-top tables for those who prefer them. The best way to describe the menu is eclectic. There are shareable small plates, pasta dinners, a raw bar, pizza and charcuterie. Other mains include everything from the 50 oz. bone-in ribeye (shareable for most) and roast suckling pig to burgers and chicken. We decided to start off our meal with a couple small plate appetizers. 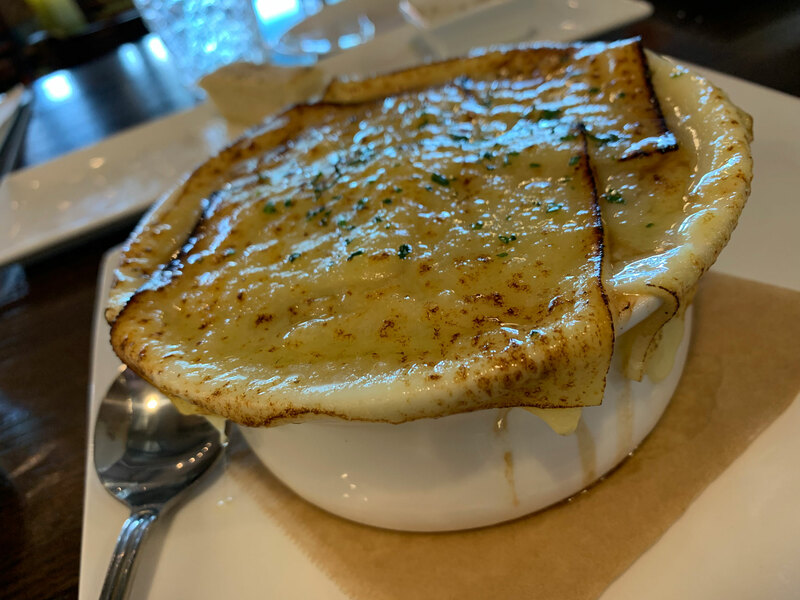 I ordered the French onion soup, expecting a typical crock. What I got was an enormous bowl about twice the size of what normally constitutes a “bowl” at most restaurants. It could have easily been a meal by itself, especially with how good it was. It was heavy with onion and thick chunks of bread. And there was more than enough cheese layered on top to go with every salty-sweet bite. Julie also ordered an appetizer, the shrimp cocktail. As she told me, she was craving shrimp for a while and was not disappointed. 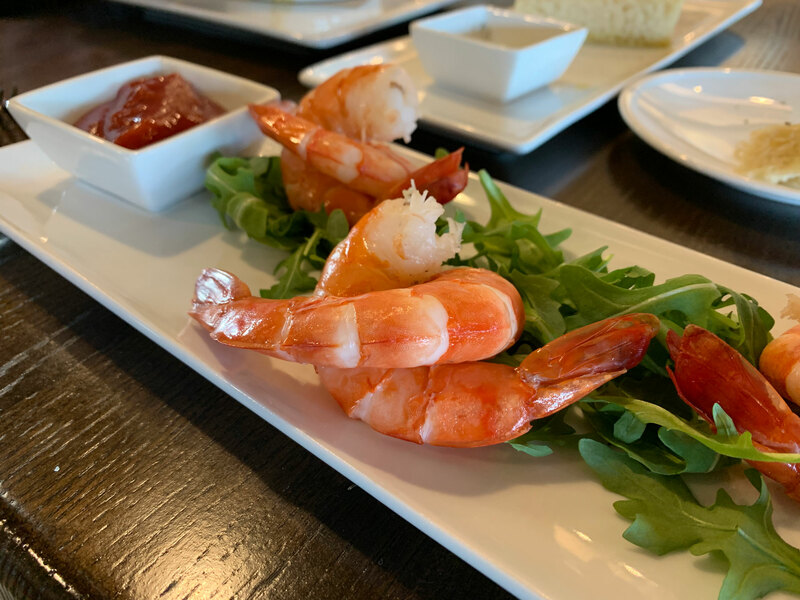 The six shrimp were presented beautifully, each one connected gracefully. While cold shrimp are cold shrimp, these were colossal in size and even better for scooping into the cocktail sauce. Julie’s craving was satisfied. Deciding on a main course wasn’t easy but I eventually settled on the Bolognese pasta, one of five such pasta options on the menu. 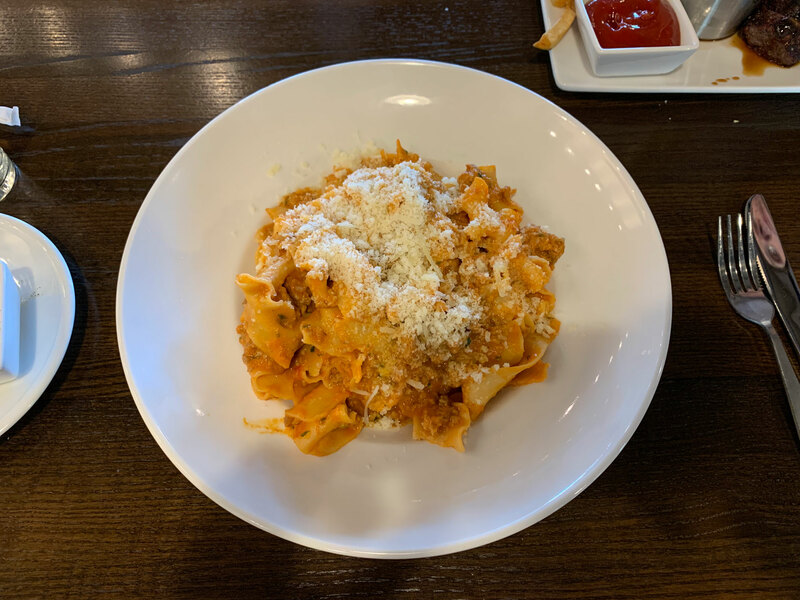 The pappardelle pasta was served with a sauce of Iberico pork (an imported meat from the Iberian peninsula of Europe), veal, tomato, cream and grana cheese. It was a good meal – very hearty and more than enough food – but I had enjoyed the soup more. I have also had Bolognese pasta other places and I didn’t find that this version stood out among the others. 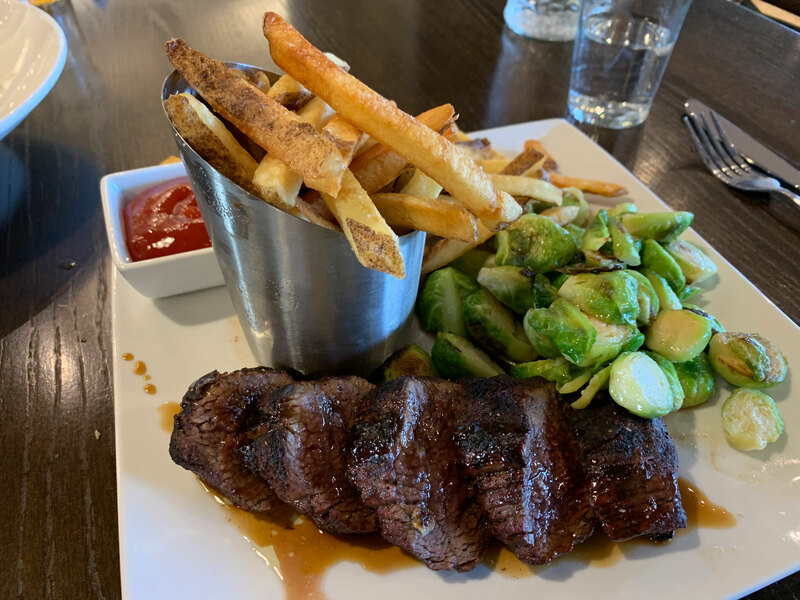 For her meal, Julie had opted for the steak frites – steak in demi glace, served with fries and Brussels sprouts. The steak was cooked beautifully and the semi-sweet demi glace paired beautifully with the savory cut of meat. The fries were good – thick, fresh-cut fries and plenty of them. Brussels sprouts are a vegetable where you can only do so much to them. They were fine but better with a little of the demi glace. Before our meals arrived, we were served a plate of thick focaccia bread, unique in that there were thin slices of tomato baked into the top. It was served with a cup of oil for dipping and was very good. Take one look through the Yelp reviews and you’ll see a range of opinions, mostly centered on price and service. As for price, our final total was around $80. It wasn’t a cheap night out, but with two appetizers, an iced tea and two entrees (both of which were enough that we took home leftovers), I can’t say we were cheated, but the price of every item was a couple dollars higher at B2 than other places. A margherita pizza, for example, costs $12 at B2; the same costs $9 at Nonno Alby’s a block away. The service was fine during our visit. Our server was a little slow to take our food order and with our check at the end of the night, but we were still in-and-out in just under an hour so it wasn’t a long wait by any means. (And I didn’t mind that he called me “boss” throughout our visit). 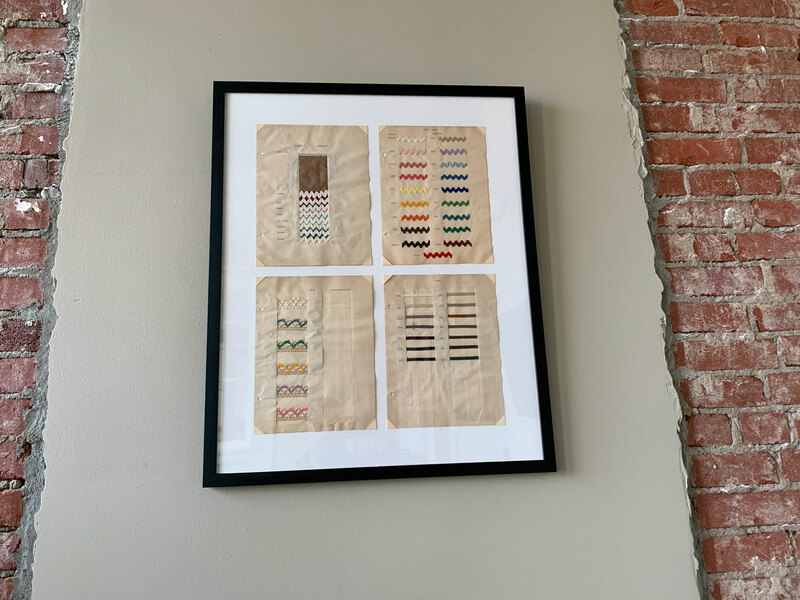 Overall, I was impressed. It’s a cool spot and all of the food was good-to-great. Though I saw high chairs, it’s not a place we would take our little one (he spent the evening with his grandparents). 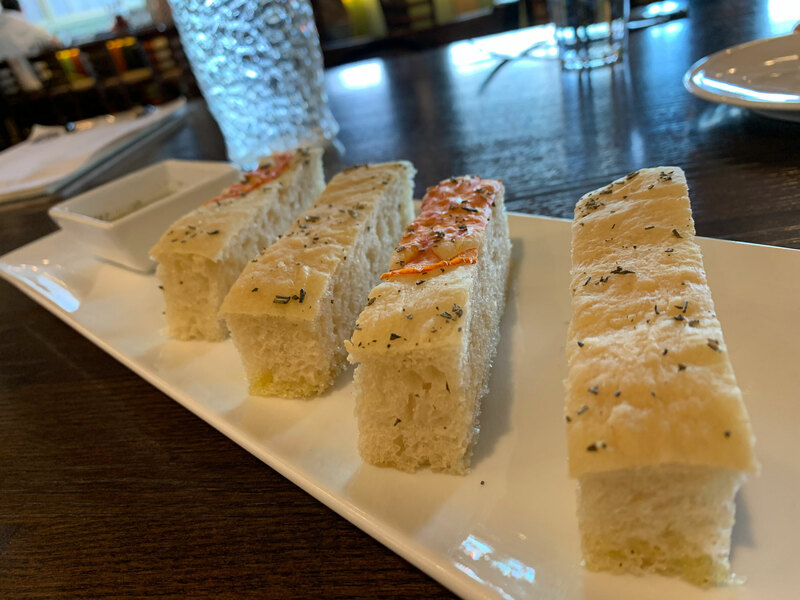 But for a date night or a night out with friends, B2 Bistro + Bar is a good choice.